Schizophrenia is a complex brain disorder with molecular mechanisms that have yet to be elucidated. Previous studies have suggested that changes in gene expression may play an important role in the etiology of schizophrenia, and that microRNAs (miRNAs) and transcription factors (TFs) are primary regulators of this gene expression. So far, several miRNA-TF mediated regulatory modules have been verified. We hypothesized that miRNAs and TFs might play combinatory regulatory roles for schizophrenia genes and, thus, explored miRNA-TF regulatory networks in schizophrenia. We identified 32 feed-forward loops (FFLs) among our compiled schizophrenia-related miRNAs, TFs and genes. Our evaluation revealed that these observed FFLs were significantly enriched in schizophrenia genes. By converging the FFLs and mutual feedback loops, we constructed a novel miRNA-TF regulatory network for schizophrenia. 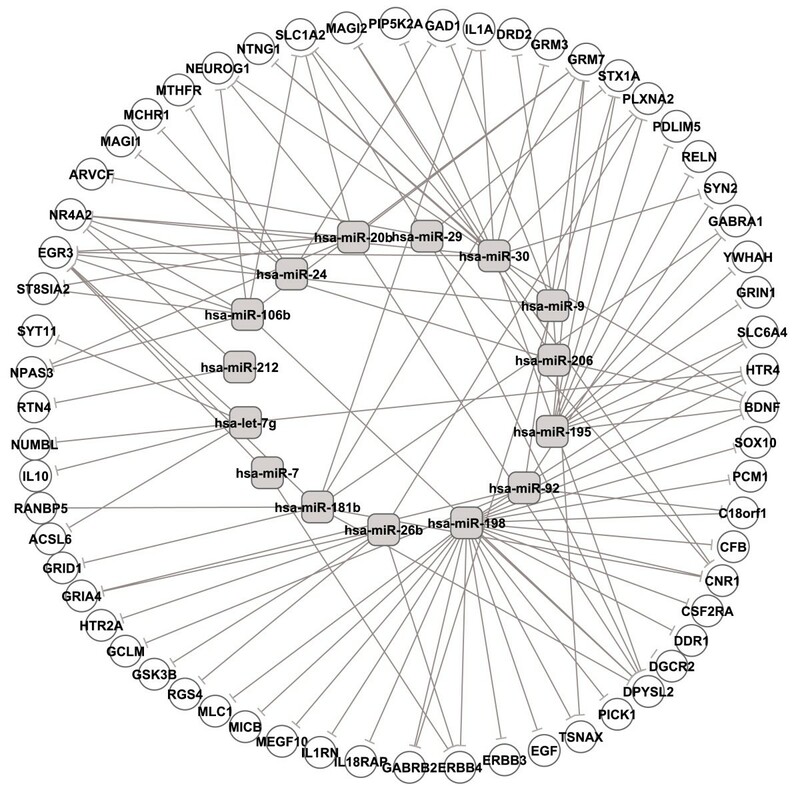 Our analysis revealed EGR3 and hsa-miR-195 were core regulators in this regulatory network. We next proposed a model highlighting EGR3 and miRNAs involved in signaling pathways and regulatory networks in the nervous system. Finally, we suggested several single nucleotide polymorphisms (SNPs) located on miRNAs, their target sites, and TFBSs, which may have an effect in schizophrenia gene regulation. This study provides many insights on the regulatory mechanisms of genes involved in schizophrenia. It represents the first investigation of a miRNA-TF regulatory network for a complex disease, as demonstrated in schizophrenia. Schizophrenia is a complex, chronic and severe brain disorder. So far, its pathophysiology and molecular mechanisms have remained poorly understood . In the last decade numerous linkage and association studies, including a few genome-wide association studies (GWAS), have been performed to identify genetic predispositions to the disease, but most studies have been inconclusive. The limited success in the detection of genetic factors led us to hypothesize that schizophrenia is likely caused by the altered expression of many genes, which may individually contribute only a small risk, but may in aggregate interact at the biological pathway or gene-network level. Recently, patterns of differential gene expression have been identified between schizophrenia case and control samples [2, 3]. MicroRNAs (miRNAs) and transcription factors (TFs) are main regulators of gene expression. MiRNAs are short endogenous noncoding RNAs that mediate post transcriptional regulation and regulate a wide range of biological processes and diseases [4, 5]. In the nervous system, studies have reported involvement of miRNAs in brain development, neuronal differentiation, and synaptic plasticity, all processes that have been implicated in neurological syndromes such as schizophrenia, fragile × syndromes, Parkinson's disease and Huntington's disease . Specifically, 18 miRNAs were recently found to be differentially expressed in post-mortem brain samples of schizophrenia patients and controls [6, 7]. Interestingly, a case-control association study revealed that two single nucleotide polymorphisms (SNPs) in miRNAs hsa-miR-206 and hsa-miR-198 were significantly associated with schizophrenia . Furthermore, brain miRNAs affected by a microdeletion syntenic to human 22q11.2 were found in mouse models and human individuals carrying this microdeletion are at high risk of developing schizophrenia . It has also been reported that miRNA hsa-miR-195 regulates BDNF and alters the expression of downstream GABAergic transcripts in schizophrenia . Most recently, studies found that a miRNA regulates signaling downstream from the NMDA receptor, suggesting miRNAs as a new mechanism for altering brain gene expression in schizophrenia [11, 12]. This accumulating data suggests that miRNAs may play important roles in the expression of genes linked to schizophrenia. Transcription factors are essential regulators of gene expression in all living organisms. A TF regulates transcription of its target gene by specifically binding to the transcription factor binding site (TFBS) in the gene's promoter region. Since expression of an miRNA may be regulated by a TF , TF and miRNA may reciprocally regulate one another to form feedback loops, or alternatively, both TF and miRNA may regulate their target genes and form feed-forward loops (FFLs). Two recent studies explored hundreds of potential miRNA-mediated feedback and feed-forward loops at the genome level in mammals and found some interesting regulatory motifs [14, 15]. Besides, Martinez et al. combined experimental and computational methods and identified 23 miRNA-TF composite feedback loops in C. elegans. Several feedback loops and FFLs have been experimentally verified in mammals, such as feedback loops between ZEB1/SIP1 and miR-200 family in embryological development, E2Fs and miR-17/20 in cellular apoptosis, PITX3 and miR-133b in midbrain dopamine neurons, and a FFL E2Fs-Myc-miR-17/20 [17–19]. These studies were performed at the whole genome level by a computational approach or for specific FFLs by experimental validation, rather than a comprehensive miRNA-mediated network analysis for a specific complex disease or tissue. In this study, we explored miRNA-TF regulatory networks in schizophrenia. Among schizophrenia candidate genes (SZGenes), we identified the potential targets of TFs and schizophrenia related miRNAs. These datasets and their regulations were used for miRNA-mediated feedback and feed-forward loop analysis. We revealed some schizophrenia related miRNA-TF regulatory modules and constructed a converged miRNA-TF regulatory network in which EGR3 and hsa-miR-195 served as core regulators. By combining miRNA-TF network analysis and literature survey, we proposed a pathway model highlighting EGR3 and miRNAs involving in the signal transduction and regulatory pathways in schizophrenia. Our goal is to explore miRNA and TF regulation in schizophrenia genes. Figure 1 provides an overview of miRNA and TF mediated regulatory network construction. We first compiled a list of 20 experimentally verified schizophrenia related miRNAs (SZmiRNAs), which matched 21 mature miRNAs and 29 miRNA precursors (Table 1). Most of the 29 SZmiRNAs are conserved in vertebrate genomes and 9 are even conserved in Drosophila. Only one (hsa-miR-198) is primate-specific and two (hsa-miR-195 and hsa-miR-206) are mammal-specific. Sixteen SZmiRNAs (55%) were found in miRNA clusters. For comparison, we also collected and curated 87 brain expressed and 79 non-brain expressed mature miRNAs, which corresponded to 105 and 94 miRNA precursors, respectively (see Additional file 1). aAntisense: miRNA and its host gene are on opposite strand. 3'UTR: miRNA locating on the 3'UTR of its host gene. The remaining miRNAs are in the intron of their host genes. bTaxonomy conservation: P: primates (human, chimp, rhesus monkey); M: mammals (human, mouse, rat, dog); V: vertebrates (human, mouse, rat, dog, chicken, frog, fish); A: animals (human, mouse, chicken, fish, fly). An overview of miRNAs, TFBSs/TFs and their regulatory network in schizophrenia. SZ: schizophrenia; FFL: feed-forward loop. We predicted miRNA targets in SZGenes by parsing TargetScan prediction results. Among the 160 SZGenes, 61 were potential targets of our complied 29 SZmiRNAs. Figure 2 displays these miRNA and target pairs. Among the 61 target genes, the top three genes targeted by the largest number of SZmiRNAs were EGR3, DPYSL2 and CNR1, which were targeted by 15, 13 and 11 SZmiRNAs, respectively. Among the 29 SZmiRNAs, the miRNAs targeting the largest number of SZGenes were hsa-miR-198, miRNAs in miR-30 family and hsa-miR-195, which targeted 23, 14 and 11 genes, respectively (see Additional file 2: Table S1). Hsa-miR-198 had the largest number of targets because it is a primate-specific miRNA and the predicted target sites may not be conserved with a high false positive rate. Schizophrenia candidate genes targeted by schizophrenia related miRNAs. To simply the figure, miRNA family names are used for their precursors. To test whether we observed more SZmiRNA targets in the 160 SZGenes, we ran a permutation to count the number of targets of each SZmiRNA in 160 randomly selected genes, and repeated this process 10,000 times. Most (25 of 29, 86.2%) of SZmiRNAs had a significantly larger number of targets in SZGenes than randomly selected genes (t-test, p-value < 0.001), while hsa-miR-206 had fewer targets in SZGenes and the difference for 3 miRNAs in hsa-miR-7 family was not significant (see Additional file 2: Fig. S1). Using stringent criteria (Z score >2.33 in UCSC Genome Browser) and conservation among the human, mouse and rat genomes, we obtained 517 TFBSs in the promoter regions of 115 of the 160 SZGenes and 184 TFBSs in the promoter regions of 18 of the 29 SZmiRNAs. Among the 115 SZGenes, 79 (68.7%) had fewer than 5 TFBSs and 10 (8.7%) had more than 10 TFBSs. Among the SZmiRNAs, hsa-miR-212 and hsa-miR-195 had more than 20 TFBSs (see Additional file 2: Fig. S2). These observations seemed to reflect a complex regulation of schizophrenia related genes, TFBSs and miRNAs. We obtained 32 FFLs when we combined the regulatory relationship of SZGenes, SZmiRNAs and TFBSs (Table 2). We performed following two tests to evaluate the enrichment of these observed FFLs in the SZGenes. First, we compared the FFLs obtained from SZmiRNAs with those from brain miRNAs or non-brain miRNAs and then evaluated the significance by Fisher's exact test. The difference was highly significant in the comparison of FFLs by SZmiRNAs versus non-brain miRNAs (p = 1.80 × 10-5) and significant by SZmiRNAs versus brain miRNAs (p = 0.02) using the same SZGenes (Table 3). To increase the confidence, we did similar FFL analysis using three other schizophrenia candidate gene lists (see Methods). When we compared SZmiRNAs with non-brain miRNAs, the p-value was always highly significant, indicating that we observed more FFLs by SZmiRNAs than by non-brain miRNAs (Table 3). We noticed that the p-values in the comparison between SZmiRNAs and brain miRNAs were slightly significant or even insignificant. This likely represents some brain miRNAs in our data set that may be schizophrenia related but that have not yet been reported. P-value was calculated by Fisher's exact test between SZmiRNAs and brain miRNAs or between SZmiRNAs and non-brain miRNAs. Secondly, we ran 10,000 random simulations (see Methods). In each run, since there were 209 miRNA target pairs between SZmiRNAs and SZGenes, we randomly selected 209 miRNA target pairs out of all target pairs of the 29 SZmiRNAs and calculated the number of FFLs among TFBSs, SZmiRNAs and those randomly selected target genes. We calculated a p value = 0.0009, indicating that our observed FFLs differed significantly from chance. TF and miRNA may regulate one another and form a composite feedback loop. We identified 14 SZmiRNA-TF mutual regulatory loops (pairs). Twelve of these had at least one TF or miRNA in the TF-SZmiRNA-SZGene FFLs and 5 pairs had all components included in the FFLs (see Additional file 2: Table S2). We merged the 12 FFL-related SZmiRNA-TF loops with TF-SZmiRNA-SZGene FFLs and constructed a miRNA-TF regulatory network for schizophrenia. It included 12 SZmiRNAs, 16 SZGenes, 29 TFs and 110 links (edges) between these molecules (nodes) (Figure 3). Among these 16 SZGenes, several (DRD2, GRIN1, GRM7 and GAD1) are related to three neurochemical hypotheses in the molecular mechanisms of schizophrenia, i.e., the dopamine, glutamatergic and GABAergic hypotheses . 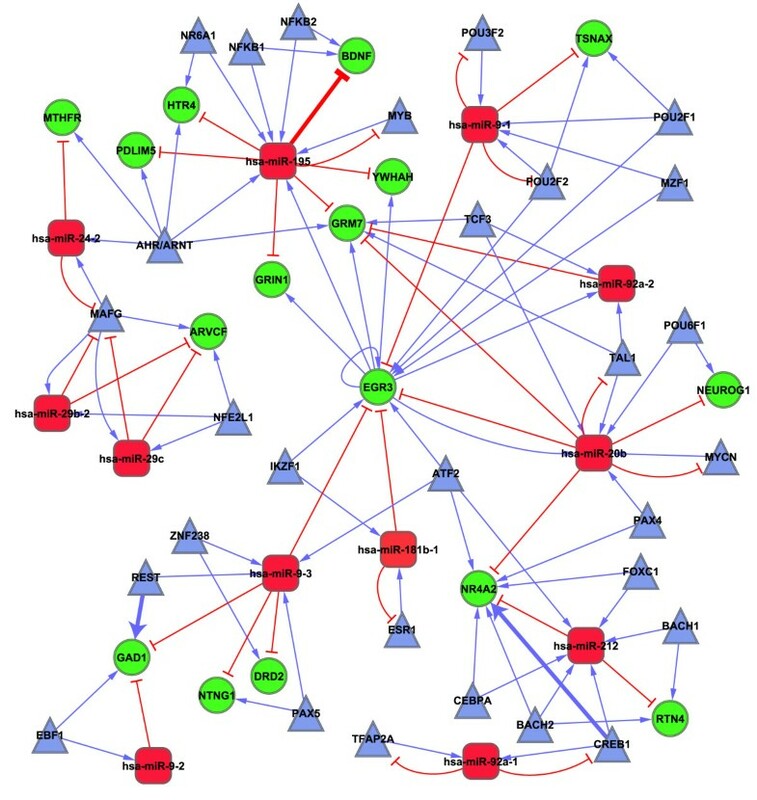 Three TFs (ESR1, MYB and TFAP2A) in this network had association information in the SchizophreniaGene database  but only the ESR1 gene had a positive association study . Moreover, there were 3 pairs of regulation (hsa-miR-195 represses BDNF gene, TF REST regulates GAD1 gene, and TF CREB1 regulates NR4A2 gene) that had been previously experimentally verified  or annotated in the Ingenuity Knowledge Base . A miRNA and TF mediated regulatory network in schizophrenia. Red: schizophrenia related miRNAs; green: schizophrenia candidate genes; blue: TFs. Three thick lines denote regulations with experimental evidence. There were 5 core genes (EGR3, hsa-miR-195, hsa-miR-20b, hsa-miR-9-3 and GRM7) in the miRNA-TF regulatory network (Figure 3) according to the definition in the Methods section. We extracted subnetworks for these 5 core genes by including the core genes and their directly linked molecules in the miRNA-TF regulatory network (see Additional file 2: Fig. S3). In this subnetwork analysis, EGR3 stood out as a promising gene and regulator. As a gene, it is regulated by 5 TFs and 4 SZmiRNAs, while in its capacity as a TF, it regulates 3 SZGenes and 3 SZmiRNAs. EGR3 is the only gene in the network that links to all 4 of the other core genes. Among the 3 core miRNAs (hsa-miR-195, hsa-miR-20b and hsa-miR-9-3), hsa-miR-195 seems most promising. It regulates 6 of the 16 SZGenes in the network, while it is also regulated by 6 TFs (Figure 3, see Additional file 2: Fig. S3B). We examined the predicted targets of these 3 miRNAs on all human genes and found 734, 725, and 826 predicted targets, respectively. We next examined the enriched pathways of these predicted targets of the 3 core miRNAs using the Ingenuity Pathway Analysis (IPA) tool. Interestingly, we found many neuron or schizophrenia related pathways, such as axonal guidance signaling and reelin signaling in neurons (Table 4). There were two enriched pathways shared by the targets of these 3 core miRNAs: axonal guidance signaling and Ephrin receptor signaling. Axon guidance is one of the critical steps in the proper formation of a neuronal network , and Ephrin/Ephrin receptor signaling is one of the bidirectional signaling systems implicated in the control of axon guidance and synapse formation in many neural systems . This analysis suggests that these 3 core miRNAs may have important regulatory roles in the neuronal network. Finally, we examined the enriched GO terms of these predicted targets. Interestingly, among the enriched GO terms were several related to regulation and neurodevelopment such as "transcription regulation", "neuron differentiation" and "neurogenesis" (see Additional file 2: Table S3). aPathways in italic are related to nervous system or schizophrenia. SNPs on miRNA target sites and TFBSs have been associated with many complex diseases [4, 25, 26]. So far, most of the SNPs associated with schizophrenia have not been in exonic regions . Thus, it is important to examine SNPs in these schizophrenia related miRNA genes and their target sites and TFBSs. We identified 7 SNPs on the SZmiRNA target sites of 7 SZGenes, 14 SNPs on TFBSs of 13 SZGenes and 5 SNPs on TFBSs of 5 SZmiRNAs. Moreover, we found 4 SNPs in pre-SZmiRNAs and 18 SNPs in the expanded regions (100 bp each side) of pre-SZmiRNAs including one SNP (rs41283391) located 46 bp upstream of hsa-miR-195 pre-miRNA (see Additional file 3). There were two publicly available GWA studies (CATIE and GAIN) for schizophrenia, neither of which has yet been successful in identifying significant genome-level markers . Surprisingly, all of these SNPs except one (rs1700 in hsa-miR-198), were not included in either GWAS marker set. We found two potential regulatory SNPs in GRM7, one of the five core genes. These two SNPs were located on TFBS (V$AHRARNT_01, SNP rs62237229) and miRNA target site (hsa-miR-20b, SNP rs56173829). Both V$AHRARNT_01 and hsa-miR-20b were included in our FFLs. Our literature search revealed that these SNPs and sites have not been studied for schizophrenia. Further experimental verification is warranted. We deposited all miRNAs complied in this study and their potential targets in schizophrenia genes into S chiz ophrenia G ene R esource (SZGR), a comprehensive online resource including genetic and biological data for schizophrenia genes . SZGR deposits genetic data from all available sources including association studies, linkage scans, gene expression, literature, GO annotations, gene networks, pathways, and miRNAs and their target sites. Moreover, SZGR provides online tools for data browsing and searching, data integration, custom gene ranking, and graphical presentation. We performed an exploratory miRNA-TF mediated regulatory network analysis, identifying some promising FFLs and mutual feedback loops in schizophrenia. In the converged network, we identified 5 core genes including EGR3 and hsa-miR-195 that likely play important regulatory roles. The network also includes some well-studied schizophrenia candidate genes (e.g., BDNF, DRD2, GRIN1 and GAD1). Although this investigation started from experimentally verified schizophrenia-related miRNAs, miRNA-TF-gene regulations, and a set of schizophrenia candidate genes prioritized by multiple lines of genetic evidence, most of the miRNA targets and TFBSs used in this study are putative and not error-free. At present, miRNAs have not been well tested for association with schizophrenia. The number of schizophrenia related miRNAs is expected to be greater than what we compiled. However, our analysis and subsequent permutation tests indicated that our regulatory network is nonrandom in the whole molecular network. The identified network modules provide potential targets for follow-up experimental verification, and provide important insights into the etiology of schizophrenia. We discuss some potential pathways below. EGR3 encodes a zinc finger transcription factor and plays important roles in cellular growth, environmental stimuli, muscle-spindle development and neuronal development . In neuronal development, EGR3 is required for normal terminal axon extension and branching, sympathetic target tissue innervation and function, and hippocampus-dependent learning and memory processing [30, 31]. EGR3 indirectly modulates synaptic plasticity through its regulation of the ARC gene, a synaptic activity-induced effector molecule . In developing neurons and epilepsy, BDNF is the endogenous signal that induces EGR3 expression via a PKC/MAPK-dependent pathway, and then EGR3 up-regulates the expression of GABRA4 by binding its promoter [33, 34]. EGR3 is required in mediating the response to stress and novelty . EGR3 has been reported to be associated with schizophrenia in both case-control and family-based studies and its expression has been shown to be decreased in schizophrenia patients [36, 37]. Mice lacking EGR3 and schizophrenia patients display a similar decreased susceptibility to the side effects of antipsychotic medications . These studies consistently suggest an important role for EGR3 in neuron activity and schizophrenia. Moreover, EGR3 is a downstream gene of many signaling pathways including pathways triggered by NGF, BDNF and NRG1 [30, 34, 39, 40], of which BDNF and NRG1 are schizophrenia susceptibility genes. Both EGR1 and EGR2 are induced by BDNF signaling in primary cortical neurons  and EGR3 has been proved to be a target gene of EGR1 . EGR3 and EGR1 directly regulate the expression of NGFR (p75NTR) , a receptor of all neurotrophins, including NGF and BDNF. Interestingly, NGFR is involved in the regulation of axonal elongation  and EGR3 shares a similar function . EGR3 is regulated by the calcium-responsive protein phosphatase calcineurin , which might be triggered by a calcium influx through NMDARs , whose activation also induces EGR3 mRNA expression . PPP3CC (encoding calcineurin catalytic γ subunit) is located very close to EGR3 on chromosome 8 and was reported to be associated with schizophrenia [37, 48]. Furthermore, the calcineurin/NFAT signaling pathway is required for neuronal development and axon growth, but it has little or no effect in neuron survival [49, 50]. Interestingly, EGR3 is also required for normal axon extension and branching, but not for neuron survival . Neurotrophins (NGF and BDNF) stimulate NFAT nuclear translocation and activation of NFAT-dependent transcription in cortical neurons . It has been proposed that some unknown factors involved in calcineurin/NFAT signaling induce axon growth [49, 50]. Based on these literature surveys and our miRNA-mediated regulatory network analysis, we propose that EGRs, especially EGR3, are key factors regulated by calcineurin/NFAT signaling in neuronal development. Moreover, in the immune system, NFAT directly transactivates EGR3 and EGR2, then activates the expression of FasL to trigger cell apoptosis . The above discussion led us to propose a model of the involvement of EGR3 and miRNAs in signaling pathways and regulatory networks within nervous system and schizophrenia (Figure 4). We inferred that EGR genes, especially EGR3, are downstream of BDNF, NRG1, and NGF via two pathways: MAPK-dependent signaling pathway and calcium-dependent calcineurin/NFAT signaling pathway. EGR3 expression is triggered by these two pathways after signal stimulation. Then, EGR3 activates its target protein-coding genes (e.g., ARC, GABRA4 and NGFR) and miRNAs (e.g., hsa-miR-195 and hsa-miR-20b). These target genes subsequently trigger downstream genes and pathways, inducing processes such as synaptic plasticity, axon extension, GABAergic and regulating expression of BDNF and DRD2. Model of EGR3 and miRNAs involving in signaling pathways and regulatory networks in schizophrenia and nervous system. 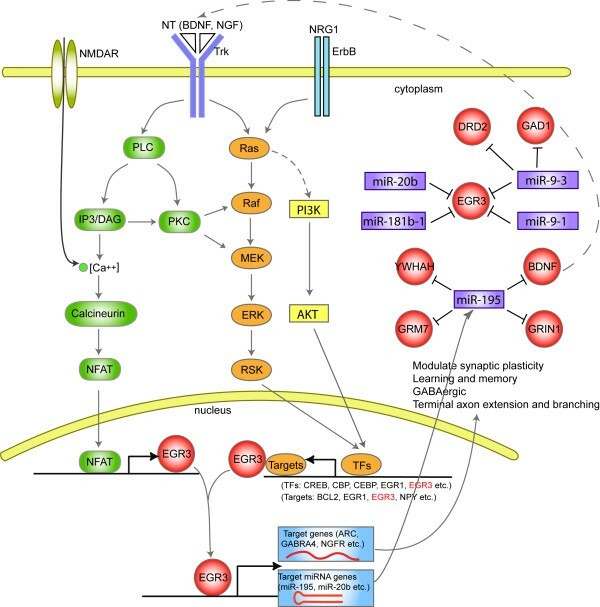 Binding of neurotrophins (BDNF or NGF) to Trk receptors activates multiple signaling pathways, including Ras/MAPK cascade, PKC, PI3K/AKT, and IP3/calcium signaling [72, 73]. Stimulation of NRG1 activates MAPK and PI3K/AKT pathways . These signal transductions trigger activation of several TFs such as CREB, CBP, EGR1 and EGR3, which subsequently activate their target genes (e.g., EGR3, BCL2 and NPY). Calcium influx through NMDARs activates calcineurin/NFAT signaling pathway, then activates target genes such as EGR3 [46, 49]. EGR3 regulates its target genes (e.g., GABRA4, ARC and NGFR) and miRNAs (e.g., hsa-miR-195 and hsa-miR-20b). Hsa-miR-195 is a core miRNA potentially targeted by 6 TFs and also targeting 6 SZGenes in our network. It was reported significantly down-regulated in the prefrontal cortex of schizophrenia patients . So far, it has been the only miRNA whose regulation of schizophrenia genes has been verified by experimental evidence. It regulates BDNF, altering the expression of downstream GABAergic transcripts (NPY, SST and PV) in schizophrenia patients . Note that BDNF also affects GABAergic system as a mediator of EGR3-induced GABRA4 regulation in developing neurons . In our miRNA-mediated FFLs, EGR3 potentially regulates hsa-miR-195. Thus, hsa-miR-195, BDNF and EGR3 form a critical feedback regulatory loop (Figure 4). The predicted targets of hsa-miR-195 are enriched in neuron related pathways, such as axonal guidance signaling, reelin signaling in neurons, long term synaptic potentiation and Ephrin receptor signaling pathways (Table 4). In combination, the evidence above suggests that hsa-miR-195 might be a key miRNA in schizophrenia as well as nervous system. FFL is an important regulatory motif and has been found in organisms such as Escherichia coli, yeast and human . A traditional FFL is composed of two TFs and one target gene in gene expression regulation. Because miRNAs play key regulatory functions in gene expression, a FFL consisting of a TF, miRNA and a target gene is likely a powerful tool to investigate regulatory mechanisms of diseases at both the transcriptional and translational levels. It has been estimated that there are several thousands of human genes under this combinatory TF-miRNA regulation . At present, only a few FFLs have been experimentally verified. Some examples include E2Fs-Myc-miR-17/20 , E2F-miR-106b/93/25-CDK inhibitors  and PKC-MAPK-miR-15a . A miRNA-TF composite feedback loop is a direct regulation motif. Some experimental examples are ZEB1/SIP1 and the miR-200 family in embryologic development and Pitx3 and miR-133b in neuron development [17, 18]. In our miRNA-mediated network in schizophrenia, we found an interesting miRNA-TF loop, the miR181-ESR1 loop. ESR1 is the only TF in our network whose gene has positive association result for schizophrenia . Some SNPs in ESR1 were also found significantly associated with schizophrenia in our genotyping project (unpublished data). Additionally, Inoue et al. suggested EGR3 being a target of ESR1 in breast cancer cells. Since EGR3 is a core gene in our miRNA-mediated schizophrenia network, this provides another link for ESR1 to schizophrenia. We compiled schizophrenia related miRNAs to predict SZmiRNA-TF-SZGene FFLs and found significantly more SZmiRNA-related FFLs in schizophrenia candidate genes. This is the first study of miRNA-TF regulatory networks in schizophrenia. We revealed that EGR3 and hsa-miR-195 are critical in the schizophrenia regulatory network. EGR3 is at the convergence of several signaling pathways, miRNA regulatory networks, adaptation to stress, and genetic susceptibility to schizophrenia. Although this study is exploratory, it provides an alternative and, perhaps, an effective approach for studying the regulatory mechanisms of genes involved in schizophrenia. We compiled schizophrenia related miRNAs (SZmiRNAs) from three studies: (1) 16 miRNAs differentially expressed in prefrontal cortex of schizophrenia patients from controls ; (2) 2 miRNAs differentially expressed in postmortem cortical tissues of schizophrenia patients from controls ; and (3) 2 miRNAs in which 2 SNPs were found associated with schizophrenia in case/control samples . For comparison, we compiled two control miRNA datasets: miRNAs expressed in brain (brain miRNAs) and non-brain tissues (non-brain miRNAs). Brain miRNAs were collected from miRNA microarray expression studies and a miRNA regulation survey study [7, 56, 57]. Non-brain miRNAs were collected from two large-scale miRNA expression atlas studies [58, 59]. After we manually checked these miRNAs, we removed SZmiRNAs from brain miRNAs and, similarly, brain miRNAs from non-brain miRNAs to avoid redundancy. We obtained information of genomic locations, host genes and conservation among species of these miRNAs from miRBase (Release 11.0, genome assembly: NCBI36) . We used a list of 160 schizophrenia candidate genes (SZGenes) prioritized by a multi-dimensional evidence-based prioritization approach . These genes were selected based on integrative evidence from linkage, association, gene expression and literature search. Our follow up evaluation using independent GWAS p-values and gene expression features suggested these genes were promising . Additionally, we compiled three other SZGene lists: (1) 270 genes having at least one positive association result in the SchizophreniaGene database (accessed in April 2008) , (2) 124 genes having at least two positive results in the SchizophreniaGene database, and (3) 75 SZGenes selected by a combined odds ratio method from association studies . Among many miRNA target prediction programs, TargetScan had the best performance based on two large scale miRNA induced protein synthesis studies [63, 64]. We retrieved all the miRNA target prediction results from the TargetScan server (version 4.2, April 2008)  and then extracted the miRNA and target gene pairs by the corresponding miRNA lists (e.g., SZmiRNAs) and genes (e.g., SZGenes). Except one miRNA that is conserved only in primates (hsa-miR-198, Table 1), we required the miRNA target sites to be conserved in mammals. Although SZGenes tend to be longer , the length of the 3' untranslated regions (UTRs) in which target sites were predicted, was not found significantly different between the SZGenes and the other human genes (Wilcoxon test, p = 0.09). To examine whether SZmiRNAs have more miRNA targets in SZGenes than in non-SZGenes, we randomly selected the same number of genes from the human protein-coding genes and then counted the number of targets of each SZmiRNA for the random genes. We repeated this randomness analysis 10,000 times. Then, we used one sample t-test to test the significance. miRNAs clustered in a genomic region are preferentially co-expressed and miRNAs in gene region are usually co-expressed with their host genes, presumably due to being part of the same transcription unit [58, 59, 66, 67]. After comparing the miRNA cluster results of 3 kb, 5 kb, and 10 kb, we used a 5 kb maximum inter-miRNA distance as the miRNA cluster criteria, which is the same as in Xu and Wong . Putative promoter regions of intergenic miRNAs were estimated up to several kb upstream from the miRNA precursors [13, 69]. Here, we used 5 kb upstream of the host gene, miRNA precursor or miRNA cluster as the putative promoter region for miRNA in a genic region, intergenic region or miRNA cluster, respectively. Similar FFL results were found when we set a 1 kb promoter region (data not shown). Because TFBS is always short, i.e., a 6-8 bp core sequence, prediction of TFBS in a single species may have a much higher false positive rate than that based on conservation across multiple species. We retrieved predicted TFBS information from the UCSC genome browser (hg18 genome assembly) and required TFBSs to be conserved among humans, mice and rats. To further reduce the false positive prediction, we used Z score of 2.33 as a cutoff for high quality TFBSs. A TFBS was considered associated with a target gene when it was in the gene's promoter region and its Z score was >2.33. We analyzed FFLs for TFBSs, miRNAs and schizophrenia genes according to the procedure in Figure 1. Some TFBSs might overlap on their locations, could be bound by the same TF, or could be combined due to similar sequences. We manually merged those TFBSs to reduce redundancy. Two methods were used to evaluate if the FFLs observed in the set of TFBSs, SZmiRNAs and SZGenes were significantly enriched from genome background. First, for the same SZGenes, we used Fisher's exact test to compare the observed FFLs from SZmiRNAs with those from brain miRNAs or non-brain miRNAs. Second, we ran randomization processes using the method in Shalgi et al . In each run, we extracted the same number of random miRNA target pairs out of all predicted target pairs of the SZmiRNAs and identified TFBSs in the promoter of these random miRNA target genes, then calculated the number of FFLs. We repeated this 10,000 times, and set the p-value as the proportion of the random results that had no less than the number of FFLs observed in the set of SZmiRNAs and SZGenes. We used the Core Analysis tool in the Ingenuity Pathway Analysis (IPA) system  to analyze networks and pathways for a set of genes. We set p-value < 0.01 as the cutoff for enriched significant pathways identified by IPA. Networks were presented with Cytoscape software (version 2.6.0) . In the miRNA-TF mediated network, when a schizophrenia gene was regulated by at least 3 TFs and at least 3 miRNAs, we defined it a core gene (hub gene). Similarly, when a miRNA regulated at least 3 SZGenes and was also regulated by at least 3 TFs, we defined it a core miRNA. Enriched GO terms for a set of genes were examined using the DAVID bioinformatics web server . We thank Jeff Ewers for critical reading and improving the manuscript. This work was supported by grants from National Institute of Health (AA017437 and AA017828), Thomas F. and Kate Miller Jeffress Memorial Trust Fund, and NARSAD Young Investigator Award to ZZ. AYG prepared the data, carried out the analysis and wrote the manuscript. JS participated in the statistics test and network analysis. PJ participated in data analysis and manuscript revision. ZZ conceived of the study, participated in its design and data interpretation, and contributed to the writing of the manuscript. All authors read and approved the final manuscript.